Excellent condition, perfect working order. From the Sound Devices website. 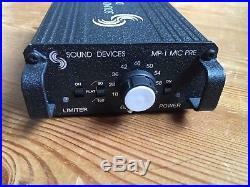 The MP-1: Portable, battery-powered microphone preamplifier with phantom power. Designed for high-definition field production environments, the MP-1 is an ideal studio-quality mic pre for critical radio, television, and film applications. The MP-1 is extremely durable and easy to use. With rugged mechanical and electrical construction and high-quality components, it will provide years of superb audio performance under the most punishing field conditions. The MP-1 provides up to 66 dB of clean, nearly noiseless gain. Its transformer-balance microphone preamplifier offers a two-position highpass filter, extended range, selectable peak limiter, and 48 V phantom power, ensuring superior sonic quality and freedom from interference problems. 66 dB of gain, in eleven discrete steps. 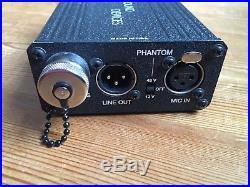 Phantom power - 48 volt or 12 volt. Limiter makes unit virtually "unclippable". High current line output drive. Excellent immunity to RF interference. Battery power (two x AA). 20 Hz to 22 kHz, +0.1, -0.5 dB; -1 dB at 50 kHz (relative to 1 kHz level with 150 ohm source). 0 dB to 66 dB input to output (switch selectable). +0.6, -0.1 dB with reference to front panel gain markings (150 ohm source, 100k ohm load impedances). 126 dBu (-128 dBV) maximum (150 ohm source, flat weighting, 22 - 22 kHz bandwidth, gain setting 36 dB or greater). +4 dBu minimum at the 0 or +18 dB gain setting. +22 dBu minimum with 100k ohm load. +2- dBu minimum with 600 ohm load. 122 dB minimum at the +18 dB gain setting. 100 dB minimum at 80 Hz, 60 dB minimum at 10 kHz. Transformer-balanced, 2k ohm input impedance. Transformer-balanced, 130 ohm output impedance. 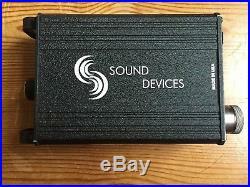 80 Hz or 160 Hz (switch selectable), 6 dB per octave. 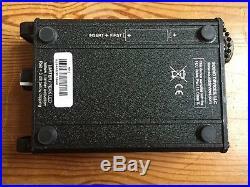 12 V or 48 V (switch selectable) per DIN 45 596 specification. Limits to +17 dBu output level 10:1 limiting ratio; 5 mS attack time, 100 mS release time; Amber/Red LED indicates limiting/clipping. 2 AA batteries, 24 hours life typical with +4 dBu signal into 600 ohms, no phantom power. Green indicates power and good battery. Red indicates power and low battery. LED turns red when approximately 4 hour of battery life remain. Mic input to line output is non-inverting. 0 to 70 degrees C, 32 to 160 degrees F. 43 mm x 94 mm x 140 mm (h x w x d), (1.7" x 3.7" x 5.55). 0.56 kg, 1.24 lbs. 0.86 kg, 1.90 lbs. Meets FCC Part 15 Class B, eligible to bear CE mark. The item "Sound Devices MP-1 Microphone Preamplifier" is in sale since Thursday, October 05, 2017. 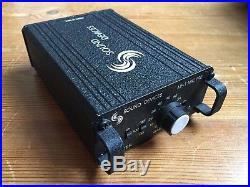 This item is in the category "Musical Instruments\Pro Audio Equipment\Preamps".rodgers" and is located in Stourbridge. This item can be shipped to United Kingdom, Austria, Belgium, Bulgaria, Croatia, Cyprus, Czech republic, Denmark, Estonia, Finland, France, Germany, Greece, Hungary, Ireland, Italy, Latvia, Lithuania, Luxembourg, Malta, Netherlands, Poland, Portugal, Romania, Slovakia, Slovenia, Spain, Sweden, Australia, United States, Russian federation, Canada, Brazil, Japan, New Zealand, China, Israel, Hong Kong, Norway, Malaysia, Mexico, Singapore, South Korea, Switzerland, Thailand.